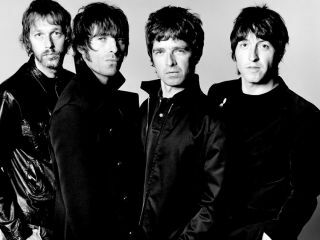 Oasis have been forced to scrap their hot-ticket show scheduled for Friday, September 12 at New York's Terminal 5, in the wake of guitarist Noel Gallagher being attacked onstage last Sunday in Toronto. Gallagher is still recuperating from a bruised hip and ribs after being shoved from behind onto the stage monitors. His injuries already necessitated the postponement of a show earlier this week in London, Ontario. Tickets for the New York show will be refunded at points of purchase. Nevertheless, Oasis will still be in Manhattan on Friday to promote their new album, Dig Out Your Soul - and in a most unorthodox way too. Band members (probably not Noel though) will teach four new songs to a group of 30 street musicians from the Metropolitan Transportation Authority's Music Under New York initiative. The street musicians will then comb the city to perform the songs on the streets and in subway stations. Oasis fans are invited to film the performances and upload them to a dedicated YouTube channel, youtube.com/digoutyoursoulsongs. The clips will be used for a documentary due out in conjunction with the Oct. 7 US release of Dig Out Your Soul. So, no show, but plenty of street theatre. Better than nothing, we suppose.